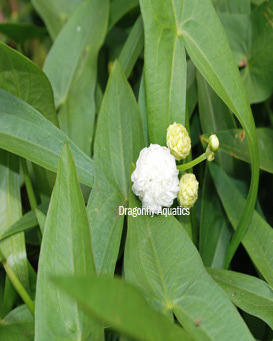 Double-Flowering Arrowhead (Sagittaria japonica) A beautiful double flowering plant that blooms all summer long. The foliage has narrow arrowhead shaped leaves. It grows 2′ to 4′ tall with a running spread and is very winter hardy. Plant in moist soil to water up to 8″ deep.